And the Orange Book patent listing champion is . . .
in the FDA's "Orange Book". See the disclaimer by accessing the menu in the upper-left corner of this page before reading further. Over my years of using the Orange Book Companion® (“OBC”), I have occasionally noticed patent listings for a product that seem to go on forever. At that time I might wonder which product of the many products in the Orange Book has the most patents listed. But other priorities would intervene, and I never did anything to satisfy my idle curiosity until now. HYSINGLA (hydrocodone bitartrate) from Purdue Pharma LP. Not surprisingly, the patent listings for AFREZZA (an insulin product administered by inhalation using a proprietary device) and BYDUREON PEN (an injectable product administered using a proprietary injection “pen”) are bolstered by a number of device patents. Also not surprisingly, the patent listings for HYSINGLA (an extended-release hydrocodone product with abuse-resistant properties) include a number of formulation patents. 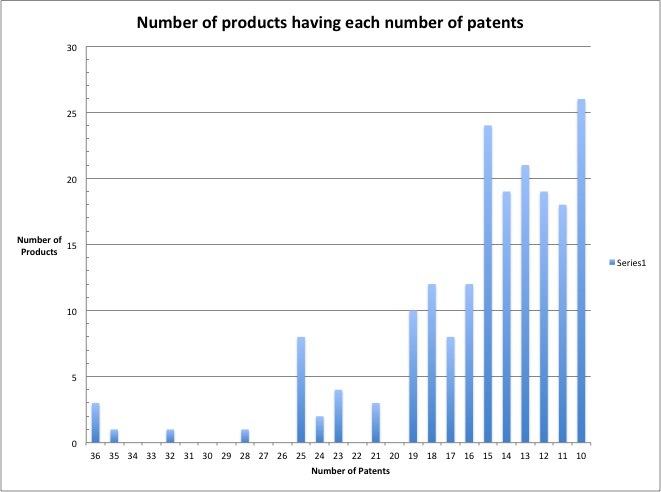 I left out the products with <10 patents since the numbers skyrocketed so high that it made the rest of the bars look very tiny. For anyone who is interested in an easy way of looking at the Orange Book patent listings for the three “champions” described above, I have added links to their full patent and exclusivity portfolios on the OBC public home page. A subscription to the OBC is not required. Just look for “Orange Book Patent Listing Champions” in the center of the page.The portfolios for the three products are in “Orange Book Companion format” which means that each patent record includes a link directly to the patent at the USPTO, and also shows the patent title, Drug Substance and/or Drug Product flags (if any), Use Codes (if any), the types of claims found in the patent, and the length of a patent extension under 35 USC 156 (if any). Patent 9,572,804 has an expiration date of October 30, 2020 for the 80 and 100 mg strengths of HYSINGLA, but that same patent has an expiration date of October 30, 2021 for the 120 mg strength. I noticed that discrepancy because the OBC algorithm created a separate table for the 80 and 100 mg strengths on one hand and the 120 mg strength on the other. That meant that there had to be some kind of difference between the tables, and led me to discover the difference in the expiration date for the ‘804 patent. This feature of the OBC shows how it can help subscribers discover inconsistencies in their Orange Book listings. So how did this happen? The ancestry of the ‘804 patent shows that it claims priority back to a non-provisional application that was filed on October 30, 2001 and to a provisional application that was filed on October 30, 2000. Could it be that someone at Purdue (or a legacy company) calculated the 2020 expiration date for the 80 and 100 mg strengths by mistakenly adding twenty years to the provisional filing date rather than the non-provisional filing date? Perdue, that will be your job to investigate. But one of the dates has to be incorrect. You may also wish to investigate whether any of the October 30, 2020 expiration dates are correct, since all of the patents with that expiration date appear to be in the same family as the ‘804 patent. The FDA has approved an old recreational drug where an unwelcome side-effect is now the indication! Welcome to the inaugural posting of Orange Book Insights. This will hopefully be the first of many. Not long ago I saw a headline in my local newspaper about the first approval of a cannabis-derived drug. No, this posting is not about that approval. My point is that the cannabis-related approval was considered significant enough to warrant an FDA press release and a newspaper headline. No, this posting is about an equally well known recreational drug whose approval in December 2017 garnered, as far as I can tell, very little (if any) publicity. There was no press release from the FDA and no separate statement from the Commissioner, as there was for the cannabis-derived drug. No, this posting is about the FDA’s approval, on December 14, 2017, of (drum roll, please . . .) COCAINE! Yes, you read that right. On July 13, 2018, the FDA approved a drug for treating a disease that no one in the entire world is suffering from. That drug is TPOXX (tecovirimat) from Siga Technologies Inc. (Siga), and it was approved for treating smallpox. Maybe you remember reading about smallpox in history books. In 1980, the World Health Organization (WHO) declared that smallpox had been eradicated from the face of the Earth. So why would any company go to the trouble of developing and then applying for approval of a drug that has no patients that need it? BS/Chem. (1974), MS/Chem. (1979), JD (1986). I worked in private practice with Morgan & Finnegan for four years. Joined Hoffmann-La Roche in 1990. Moved to Pharmacia & Upjohn in 1998, which later became just Pharmacia. Pfizer acquired Pharmacia (and me) in 2003. I have now retired from Pfizer. For over fifteen years between Pharmacia and Pfizer (until Pfizer went to a committee structure) I was the sole patent attorney responsible for all of Pharmacia's and Pfizer's patent listings in the Orange Book and for drafting our requests for Hatch-Waxman regulatory exclusivity. This included creating systems to assure that no potentially listable patents were ever overlooked. In the Pfizer committee, I created and was responsible for updating a summary of the law and regulations for Orange Book listings and the regulatory exclusivities that are available in the U.S. I also created line-by-line instructions to be used by Pfizer’s product patent attorneys for completing the FDA’s patent submission forms, 3542a and 3542. See me in my “I Love the Orange Book” t-shirt? That was a retirement present from my Pfizer colleagues in Groton, CN. The Orange Book Insights blog is published by Bruce A. Pokras for general informational purposes only. Nothing in this blog is intended to provide specific legal advice. My posting of blog entries and your receipt of such entries by accessing the Orange Book Insights blog does not create an attorney-client relationship. You should not rely on the information in any of the entries in the Orange Book Insights blog without first consulting a qualified attorney for advice tailored to your specific fact situation.